I thought that I would keep this post “light”. NOT light on calories though. I don’t believe in restricting the good things when you really want them. Cut back tomorrow. Don’t deny today. Life is short! (Refer to previous post.) Be smart, happy, healthy and enjoy the good stuff. Ben and Jerry’s Frozen Greek Yogurt. Oh wow. Have you tried the Raspberry Fudge Chunk flavor? 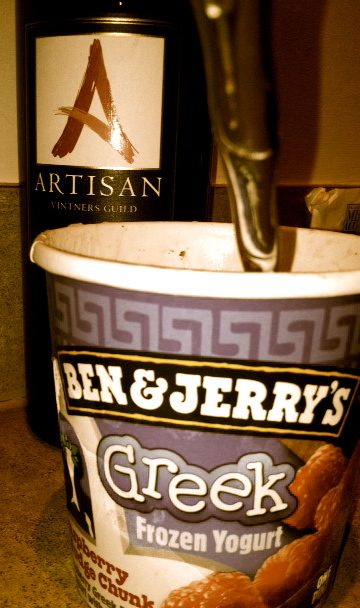 If you haven’t, I demand that you get a bottle of red wine and a pint of B&J’s Frozen Greek Yogurt. Sit down in silence, or listen to Muse’s new song, “Madness,” and enjoy. The feeling you will get from this amazing taste journey is madness. Tonight, I am drinking a wine purchased by someone else. I had no decision making power in this bottle, but it’s not too bad for grocery store wine. Have you ever tried “Artisan” Cabernet Sauvignon? Pick it up if you are out and about. I’ve developed a new love for Cabs. I used to pick a Pinot Noir as my go-to. But lately, I’ve been reaching for the cabs. I’m still a Malbec girl at heart, but I’m a sucker for a good Cab. We drank a Malbec (Renacer), a Cab and a Zinfandel, both Four Vines. I will have to say that the Zinfandel was the best of the three. So spicy!! Nothing beats a night out with good people and tasty wine. First of all, how did I not know B&J made greek frozen yogurt. WTF? I’m so exicted to try it. Secondly, I’m totally jealous you got to chill with Katie and Jordan. I wish I could have been there. Sounds like you had lots of fun. Miss you!! !